Hey there! Do you remember the String Art Star Ornament I posted a while ago? I enjoyed making that so much, that I thought I would do another little craft involving string art. Mine is a Christmas decoration, but you could always spell something else out or use a different color string to make it more of a year round thing. 1. Measure out your block of wood. Using Word or a similar program, type your word, keeping it within your measurements, then print. Trace your word onto the tissue paper and make dots where you want to put your nails. Line up and tape the tissue on the wood and, using the pliers to hold the nails in place, begin to hammer in the nails. 2. Unscrew the top of a mechanical pencil off and thread it onto the red string. Use this to help guide the thread around the nails. Start a square knot, but wait to tighten it until it is around one of the nails and leave a long tail. 3. Once you have made your way all around, use the original tail to tie another knot. Before cutting the string, put a spot of super glue on the knot and let it dry, then clip the tails. I don't know about you, but I am LOVING all of the yarn bombing popping up all over the internet. You can imagine my delight when I walked into my favorite yarn shop, Blazing Needles, and found that they had brought the fun trend indoors and incorporated it into their holiday decor. The wonderfully smart thing here is that a pallet of red and white was used without anything that completely screamed Christmas, so this decor works throughout the whole of winter! I hope the beautiful creations (by the one and only amazing Carol) inspire you to bring the bombing inside and perhaps to your holiday table. Here are a few more images of the lovely shop. Today is a great day. I get to show off the AMAZING ornaments that everyone made for the Crafty Christmas Swap. Everyone went over the top and did such a phenomenal job making beautiful decorations! I couldn't wait to get my tree up so I could show mine off properly. To give you the break down of the event, in October, 13 people (14, including myself) signed up to exchange hand crafted Christmas ornaments, which were then broken down into 3 groups. During November, they dreamt up and constructed lovely items to send to the other members of their group. Cherie Davidson, Megan Blethen, Sara Silva, Kaelie Nielsen and Julia Parkinson. 1. Trace the star on a piece of tissue paper, then, using a sewing gauge, draw another star 1/4" inside the first one. Mark where you want to put your nails. Line up the tissue on the flat side of your ornament and begin to hammer in the nails, taking care not to go through to the back. By the way, I also made the ornament below. I found the tutorial over at Notable Nest. Last week, I posted about Blazing Needles and the incredible donation they made to fill stockings that I had created. These stockings are being donated to Helping Kids With Cancer in an effort to bring some Christmas cheer to children fighting cancer and their families. I also made and filled another stocking to be donated (I just can't help myself!). Best part is that I am providing you with quick tutorial of how I made this lovely item. There are two parts to it, the stocking itself, which I will show today, and a mini quiet book closet with Velcro dress up clothes, which I will show on Thursday. 1. Pre-wash all fabric. Print the pattern, making sure that the box labeled "fit to page" is NOT checked. Piece together and tape the main stocking before cutting out. 2. Fold your main fabric in half and cut 2 stocking patterns, repeat if you are using a lighter weight fabric. Fold your flap fabric in half and cut 4 flaps (the last page of the pattern). 3. Pin 2 of your flaps right sides together. Sew along the rounded edge using a 1/2" seam allowance. Unfold and iron the seam to one side. Sew along the seam, attaching it to the side you just ironed it to. (This causes the fabric to fold to one side making a cleaner finish). Repeat this step, but iron the seam to the other side and sew it to the other side. Make a few clips along the seam so that it lays flat when you fold it right side out. (You should have a visible seam on only one side of each flap which will be the wrong side). 4. Lay down one of your stockings with the wrong side up. Place one of the flaps with the right side down on top. Line up the top edges and pin. Sew together using a straight stitch, then zig zag along the edge. Repeat the same process with the remaining stocking and flap. 5. Open up the flap and iron the seam toward the stocking. Top stitch along the top of the stocking, being careful to catch the seam as you sew. 1. To do the ruffles, fold each of your 5 rectangles in half, wrong sides together, and iron. Next, do a "dry fitting" as in place the rectangles about where you would like them to go on the stocking. This is especially necessary if you are using directional fabric or putting tulle on one side. Mark the side of the ruffle that will be angling up toward the flap with a pin. 2. Using a basting stitch, sew about 1/4" from the top of each rectangle, rounding off the corner that will be angling up toward the flap at about 1" - 2" from the end. The rounding off doesn't have to be exact as you will be bunching it anyway, but if you are really nervous about it, use a cup or a bowl to draw a round line on the ruffle before you begin sewing. 3. Pull one of the strings on each ruffle to bunch it and tie off the ends when it is bunched enough, then cut off the excess fabric from the rounded corner. 4. Do another "dry fitting" by placing all of your ruffles on the front stocking, then pin the bottom most ruffle in place and sew using a zig zag stitch to prevent unraveling. Repeat until all of the ruffles are attached; placing the topmost ruffle right under the flap. 5. If you are planning on adding the mini quiet book, then place the hook end of a large eye and hook under the bottom most ruffle and mark with a fabric pen, then hand sew to the front. 6. Pin the front and back stockings right sides together, tucking the ruffles a bit as you go. Starting about 1/2" from the top of the stocking and with the flap unfolded, sew the stocking together using a 1/2" seam allowance. End about 1/2" from the top on the opposite side. Cut off any excess fabric from the ruffles and make small clips about 1/2" apart in the seam allowance at the rounded portions of the stocking, taking care not to cut through the seam. 7. Turn the stocking right side out and sew along the flap sides with a 1/2" seam allowance. Fold the flap down and you have a lovely ruffled stocking! Lets get real, the holiday season is upon us and Christmas isn't really that far away. If you have high hopes for a handmade Christmas, now is the time to get started on those one of a kind gifts. The great news is that there are a LOT of gift ideas out there that really don't take much time. Today, I am going to highlight some from this very website to get you jump-started. This first group is for all of the knitters out there. 1. T-Shirt Yarn Star Bracelet - The great thing about this gift is that you don't even have to make a trip to the craft store, just make your own tarn from your closet! 2. Fancy Spats - Liana - Use some left over yarn from your stash for this adorable fashion statement. 3. Baby Bear Hat - Made with chunky yarn and few embellishments, this darling hat is incredibly quick and easy to make. 4. Tractor Hat - This is a great hat for the boys in your life. Plus, it is a great base for an earflap hat, just swap out the chart. Now to some lovely crochet projects. 1. Fancy Spats - Cathedral - These little shoe collars are the perfect gift for that person with a unique style. 2. T-Shirt Yarn Cluster Bracelet - If you are low on cash, then this is the item to give to your friends. Not only is it adorable, but you can make it from t-shirts in your closet. 4. Broomstick Lace Headband - Really, does it get any easier?! Make these as stocking stuffers and use up some of your left over yarn or even make some tarn to create this headband with. Ok Sewers, here are some ideas for you. 1. Poinsettia Stocking - So, the stocking itself is pretty cool, but you could use the same technique for a pillow, which would also be adorable. 2. DIY Library Bag - This bag is so easy and doesn't take much material. It would make a great gift for friends and family. You could make it on a smaller scale and fill it with homemade soaps and scrubs. 3. Custom Stuffie - Here is an outline for how to make your own custom little stuffed animal for the little cutie in your life. 4. Men's Dress Shirt to Baby Dress - This would be awesome out of a great red or green plaid shirt! Here are some random crafts that don't necessarily fall under a specific category. 2. DIY Bath Crayons - Can we say stocking stuffers? 3. Olliblocks - So fun, so quick, so easy. If you are not so much into making things, but want the look of handmade, check out my Etsy Shop. Over the summer, I participated in the August Package Pals hosted by C.R.A.F.T. and Stars and Sunshine. You may remember the Ollieblocks I made as a result of that event. Getting the package in the mail was so much fun, I thought I might extend the joy and, last night, I had the bright idea of a Christmas Ornament Exchange. I LOVE Christmas time! All the wonderful smells, the snow, the lights, the warm fuzzy feelings, and (I really should have mentioned it first) the BAKING!!!!! Anyway, back to the point. So, basically, all you do to participate is fill out the form below before October 30, 2013. Then I will split everyone into groups of 4 - 5 people and, by November 4, 2013 I will email you with contact emails/websites of the other people in your group. At that point, exchange some greetings, get to know each other, then send a lovely Christmas ornament to everyone in your group. Then, on December 10, 2013 I will host a link party so everyone can share the sweet crafty goodness they got. You can do whatever you like for this ornament, you can make it personal or general, whatever you wish. Heck, if you really feel like going outside of the box, do it! There is no ceiling on creativity here! Mostly, just have fun, get to know fellow crafty people and show off your amazing talents. To get the artsy juices flowing, I posted some great ideas below. From Martha Stewart, she really has a great team of crafters. Ok, so it's not an ornament, but still, how clever! Also from Country Living. From House Revivals, its book pages people! Found these on The 36th Avenue, precious! From Michele Made Me, these were created using frozen juice containers! A blog is not necessary to participate, however, you will need either a shop or social media profile (Facebook, Google+, Twitter, etc) and an email address. I will try to match up people from the same country, but that may not work out. So, please let me know on the form if you don't want to send your ornaments outside of your country. Please let your friends know about the fun and share this event! Lets make this a rockin party! 7. 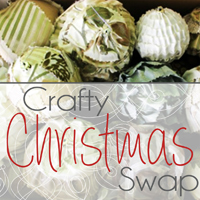 Come back to Kit's Crafts on December 10, 2013 for a link party to see all of the other creations and share what you got! P.S. If you sign up and you are the only person from your country, I will send you an email and you can decide what you would like to do. Sign ups are closed. Sorry! Check back on Dec. 10 for the show off party! Over the holidays I started looking for wreaths I could make for my door. I came across a lovely plum colored wreath, which linked me to the Simple Statement Wreath and my search ended. At first I was planning on it being a holiday staple, but I soon changed my mind and felt it needed a permanent place in my home. The major change I made was the edging. I did a ruffle instead of the eyelet surround that the original suggests. I also added some felt flowers and leaves and I used 5 strands of worsted weight yarn in lieu of chuncky. Pull from each skein of yarn so you will be working with 5 strands. For the flowers, I found tutorials for all but two of them so below are tutorials for the two I did and a list of the tutorials I found. Poppy from Positively Splendid, I just did the inner most layer. Cut 7 circle at 3"
As I predicted, I did not finish the last stocking before Christmas, but since I completely forgot to buy stocking stuffers, I suppose the point is moot. Nevertheless, I finally finished the last stocking this evening. I have to say, it is perhaps my most favorite yet. I used a reverse applique technique. The inspiration for the actual design came from a tee shirt I found on Pinterest. Start by cutting all of the pattern pieces from felt. You will need to cut an extra stocking to serve as the background for reverse applique, so you will have a top and bottom to the front. For the remainder of the stocking, follow the directions for the Origami Stocking.